Those new to database marketing often have trouble distinguishing a marketing database from an operational database. When you finish reading this editorial, you will know the difference, and why it is important. 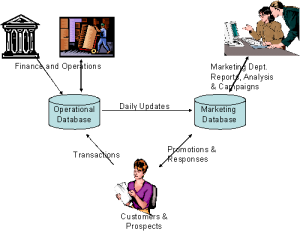 An operational database is one that is used to take orders and fulfill them. It can be a catalog fulfillment system, or something connected to a Point of Sale system in retail stores. It keeps track of inventory and payments. It takes credit cards. It is run by accountants, since it must balance to the penny. It supports the IRS tax filings and regulations. It is managed by IT for the finance and operations groups in the company. It is seldom outsourced. Records are seldom if ever deleted. It is based on accounts and transactions. Few businesses can run successfully without an operational database. A marketing database is based on customers. It keeps track of each customer and what that customer has purchased, the communications sent to the customer, and the responses back from her, including survey results, complaints, etc. The marketing is created for the marketing department, and is usually outsourced. It is used to build relationships with customers, for cross sales, up sales, reactivations and new acquisitions. It is usually in relational format so that all of a customer’s transactions can be viewed. Demographic data is often appended to it, and computed fields added: lifetime value, RFM, cumulative annual sales and transactions, and the results of campaigns. You often run National Change of Address on the database. You consolidate the duplicates when you find them. With a marketing database, the marketing department develops campaigns designed to build customer loyalty or increase sales. The customers are divided into segments based on behavior (frequent buyers) or demographics (seniors versus young marrieds, versus college students). Campaigns are created for different segments, with responses put into the database record so you can see the return on investment from each campaign. Lifetime value is used to predict the value of each customer. Models are used to predict attrition. You cannot successfully run a cell phone, long distance phone company, or credit card company without a marketing database. Marketing databases are used by banks, insurance companies, airlines, hotels and most of the Fortune 1000. When the marketing department in any company decides that it needs a marketing database, it will usually let the IT department know of it. IT, typically, will say either that “Well, we can build you one. No problem.” Or “Why can’t you just modify the operational database that we already have to accomplish your mission?” Both answers are wrong and dangerous for marketing. The reason you cannot make an operational database do the work of a marketing database is that the structure (based on accounts) and the governance (financial and operations) are inconsistent with customers and marketing. The marketing folks want to create segments, append data, compute LTV, determine next best product for each customer, post responses and survey results which are not transactions, and use the database to measure campaigns which means storing promotion history. In trying to do all of this, the marketers come up against a committee of IT and financial people who want to be consulted on everything that the marketing folks want to do with the database. They say that all this superfluous data (promotion history, appended data, householding, etc.) just slows down operations and complicates the database. They will fight any new ideas coming out of marketing. The two types of database are not the same, and cannot be merged successfully. IT usually cannot build a marketing database in house. The reason is that none of the usual IT software works. 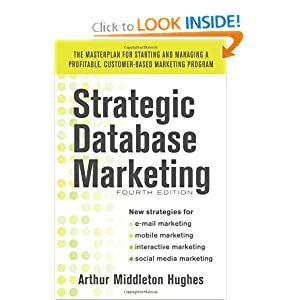 Marketing databases use new software that must be purchased. Staff has to be trained to use it. You have to have software that corrects the addresses, accomplishes duplicate consolidation, creates segments, and permits marketers to create campaigns and do back end analysis. Marketers want to have the database available to them on their PC screens so that they can view records and run counts and campaigns. You don’t do that with an operational database. The marketing database must be built in relational format on a server. In an operational database, the goal is to create a standard format that will run for months without modification. A marketing database format will be constantly changed as the department creates new campaigns, surveys, promotions, and segments, and adds demographic information such as age, income, home value, length of residence, etc. If the marketing department lets IT build the marketing database for them, they can kiss their dynamic customer relations building programs goodbye. For one reason, operational concerns always take priority over marketing. Which is more important: getting the bills out and maintaining inventory, or sending out some marketing promotion? You know the answer to that. You lose. So it is vitally important to marketing success that you have a marketing database, and that you outsource it to some service bureau that has skills, software and years of experience building and maintaining marketing database. Don’t let them tell you that you can let your marketing program hitch a ride on the operational database.